The usual disclaimers apply: not for navigation, etc. This page has some information that was originally compiled as an aid for U.S. pilots who were flying to a convention in Canada. It is not meant to replace the AOPA/COPA Guide to Cross-Border Operations, an excellent resource on this subject. The reader is assumed to have some knowledge of correct border-crossing procedures; this page is directed more toward flight planning. You will need charts. 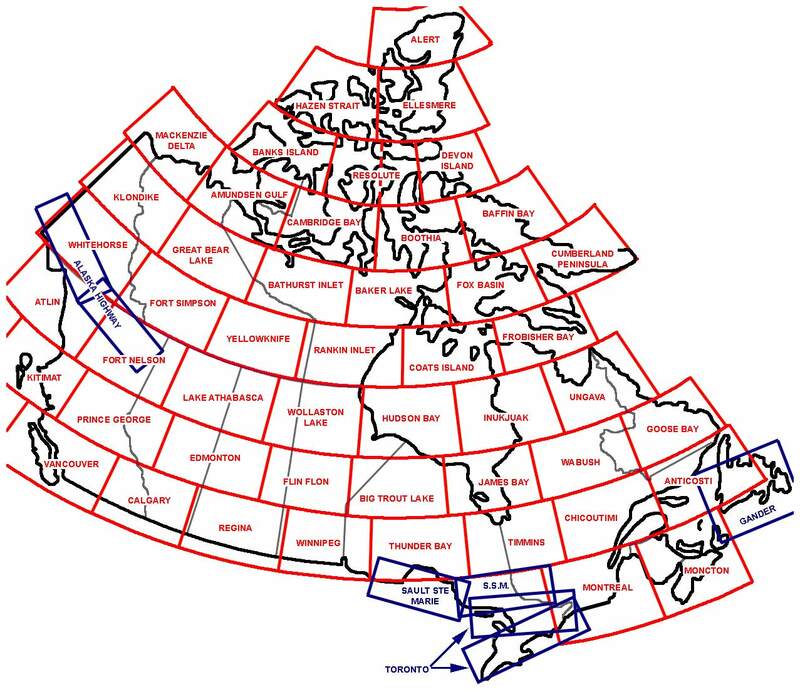 This map aligns Canadian sectional charts with provincial boundaries. Sectional depiction is similar to U.S. cartography. However, within areas that are covered by VTA (terminal) charts, there is no information but the name for each airport. When this tactic was tried in the U.S., it didn't last long. So long as it is in effect in Canada, you will make heavy use of the Canada Flight Supplement in these areas. This book is similar to the US Chart Supplements, but one volume covers the whole country. Don't expect to find charts for sale at FBOs. Canada has vastly fewer chart dealers than the U.S., and most of them are not at airports. So get your charts before you go. Here is a list of authorized chart distributors. From southern Ontario to Nova Scotia, there is significant overlap between U.S. and Canadian charts. This drawing shows how the sectional coverage compares. The Halifax sectional chart (US) covers all the Maritime Provinces except for the eastern end of Cape Breton Island. Sydney is the only Nova Scotia airport that is not on the Halifax sectional chart. There is some overlap in IFR charts, too. Although it doesn't go as far east as the sectionals, L-32 will get you to Moncton, Charlottetown, and Halifax. Class C airspace requires a clearance to enter, like class B airspace in the U.S. Because large airports have class C TCAs in Canada, there is no operational difference from the States for pilots. Mode C is required in this airspace, and in many Class D terminal areas as well. Airspace above 12,500 is class B, requiring ATC clearance. NOAA's ADDS has all METARs and TAFs (e.g., CYYC for Calgary). In Canada, flight plans are required for all but local flights, and they use the ICAO format. Here are some instructions for that form. Here is a completed sample form (PDF 259K). It is now (2017) possible to manage Canadian flight plans online. In addition to the usual documents you must carry when flying in the U.S., Canada requires you to carry proof of insurance. If the airplane you are flying isn't registered to you, you should also carry a letter from the owner (here's a sample, PDF 280K) that authorizes you to operate the aircraft in Canada for the duration of your trip. Canadian law does not require a radio license for either the pilot or the aircraft – for Canadians. Those who like to split hairs claim that this means U.S. pilots need a radio license in Canada because of their interpretation of ICAO rules. There are no known instances where a U.S. pilot has ever been asked to show Canadian authorities his radio credentials. 406-MHz ELTs are not required in Canada. There was a rule enacted, but the Minister of Transport refused to sign it, so it is moot. Here are links for Canadian and U.S. Customs Ports of Entry. Airports where U.S. Customs inspection is normally available, with phone numbers, are listed here. Everyone on board needs a book passport. Passport Cards are OK for driving across the border, but not for arrival by private airplane. If your party includes children who are not accompanied by both parents, you also need to carry a notarized letter from the absent parent(s), giving you permission to travel with their kids in Canada. Here's a sample (PDF 20K) that includes enough information to satisfy Customs Canada. You can order the Customs decal online, here. eAPIS has been a fact of life since 2009. Because eAPIS is a passenger manifest, the old PAES-178 form is no longer required, but you still need to call Customs and let them know when you're coming. If you travel often with the same passengers, you might want to register them as "crew". This way, you won't have to remember all of their vital statistics for every flight. Here is Transport Canada's advice on traffic patterns at uncontrolled airports. Many uncontrolled airports use a Mandatory Frequency. This is the same service known in the U.S. as Local Airport Advisory, except that pilot participation is required. The procedure will be familiar to pilots who remember on-field Flight Service Stations. Call [ Airport ] Radio from about the same distance you would call a control tower. The specialist who answers will advise you about airport weather and traffic, same as in the States. Call again before you taxi for departure, and expect similar services. At many locations, the specialist works in a building that used to be a control tower. So, unlike at home, he can see you and help you find your way around on an unfamiliar airport. He will automatically open and close VFR and IFR flight plans. Filing IFR? In Canada, you need an alternate regardless of the weather. And enough fuel to get there, plus reserves. Driving has been metric in Canada since the 1970s. Distances and speed limits are posted in kilometers. Gasoline is sold by the liter. If you're used to getting 33 miles per gallon, you'll get 14 km per liter. Don't push it. People who give you directions will often use "Petro-Can" as a landmark. You should look for a gas station, not a container. If you're at an intersection and see a blinking green light, it means that everybody else has a red light, and all pedestrian crossings have "Don't Walk" signals. In other words, it's OK to turn left because there's no conflicting traffic. Of course, you may also go straight ahead or turn right. You may turn right on a red light after a complete stop. You may also turn left on red if you're on a one-way street, turning into another one-way street. The only exception to these rules is on the Island of Montréal (Old City), where there are plenty of signs to warn you.